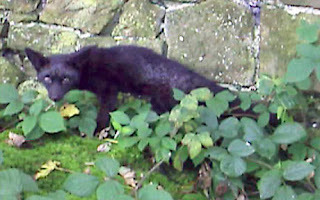 Lucky to see a black fox on HVR? Not likely! Lucky to see a black fox on HVR? Countless times we've heard of golfers on the River Course hitting "the perfect drive", but then watching a black fox run across the HVR fairway, picking up the ball, and running off ... I remember Mike Clewer telling a similar story to one of his shots. The next day outside the chalet talking to Paul Hicks & Ed Best ... a black fox runs up ... around us all, and looked totally relaxed. So was the Humber Valley Resort "Black Fox" a sign of what was to come? Or has come? The last Beach Bonfire at HVR! So it's mid September and the resort is now in administration (CCAA in Canadian terms) ... it's all a bit of a shock to everyone (even if actually not a huge surprise). Unfortunately during the previous few days almost all the staff have been laid off - and now it's down to a handful of staff - and a team of security people. No Beach House, or other meeting place - we had no idea how many people were on site ... So why not organise a reason for everyone to get together? And we did just that - and rung round every chalet to find all those on resort, and make contact with all our staff [errr ... ex-staff] friends via Facebook ... and the word was out - Beach Bonfire on Tuesday night! Has to be said that there was some who were concerned about the numbers that might turn up - but we didn't see the issue. Garlic bread, pate, cheese, marshmallows, and loads of french bread - oh and a few cases of beer were prepared, as was the bonfire. Ron (from Strawberry Hill fame) eagerly offered to make the bonfire (err "Ronfire"). He really is a very special guy. He spent the afternoon cutting logs with a friend, then built a very impressive fire. It was a chance for the staff to say goodbye to each other as they'd not had a chance previously - and it was good to meet the rest of the resort guests (not all were owners) - and Margaret Derrick came down and joinned in. Ed Best brought his guitar and we all (tried to) sing along with him. Another good reason to be CrazyAboutNewfoundland.com ... Are you? That damn black fox again! Today's staff meeting announced the layoff of almost all the remain staff at Humber Valley Resort. The only departments officially still on site are Legal, Property Sales and Construction, with Property Sales handling bookings and keyes etc! Further news from Newfound NV, and Humber Valley Resort. The following letter is from Derrick White the President of Newfound Canada - sent midday 8th Sept. The big surprise is the mention of "winding down and closing" the golf operation, amongst other services. That said, the devil is (as always) in the detail. It's all very sad - however if its part of a more co-ordinated plan, then it's hopefully a short term pain for a longer term gain for everyone involved including the local economy. Several of the people we've met in the last few days have commented that they wanted big changes for a number of years. One of the key changes in our view is the need to enable new international routes through Deer Lake airport (& Stephenville if it can attract them!). And one last comment - on various other news services we keep hearing that Europeans want subsided flights to Newfoundland (it was even said on CBC radio1 by a Brit this morning!) - but it's not what's wanted. What we ALL want is simply international routes to be available and flown - not subsidised! Then again of course to run a flight route requires guarantees - and that's where the provincial government can help. However the passengers are not wanting subsidies! It is with considerable regret, but with a determination to move forward, that we write this letter to you.As we are sure you are aware, an intensive review of HVRC, its liabilities both fiscal and legal, has taken place. During this process the company has consulted with outside advisors, the Government of Newfoundland and Labrador, and indeed, many of our owners. The resultant analysis confirms our initial suspicion that HVRC is technically unviable and whilst historic contractual obligations remain, it will always have a liability that is impossible to remedy. Initial attempts to restructure to bring the overhead to a manageable level, met with considerable opposition, threats, implied and actual, of litigation and actually uncovered other breaches that had not been previously documented. The cost of resolution was far greater than the whole asset value of the company. As per our press release of Friday, September 5, 2008, the company has sought and obtained protection from its creditors under the Companies’ Creditors Arrangement Act (CCAA). The CCAA is a Canadian federal Act that gives financially troubled corporations the opportunity to restructure their affairs through a formal plan of arrangement. This process was begun with a formal application to the Supreme Court of Newfoundland and Labrador where HVRC applied for protection under the CCAA. The court has issued an Order giving HVRC 30 days of protection from its creditors to allow for the preparation of the plan of arrangement. Once the plan has been prepared, the Company will update the market. We did not make this decision lightly. The alternative was to apply for full receivership, and to wind up HVRC. We did not feel that this was in anyone’s interests. Under the terms of the CCAA as previously described, we are able to submit to the court appointed monitor, a plan showing how we may move forward and finally deliver a sustainable resort that is financially stable, which we fully intend to do. Within this process, each of you will have a formal opportunity to submit any claims you feel that you may have to the court appointed Monitor. Ernst & Young Inc. have been appointed as our Monitor. This action will result in immediate and tangible changes to the operation of the resort. In the coming days the resort will wind down and close the following onsite operations and services: the accommodations, food and beverage, activities and golf. Strawberry Hill will also be closing its rental pool and manor house operations. Flights from Gatwick to Deer Lake will continue as per the scheduled dates on September 11 and 18. The company is presently working hard, as are other local business organizations, all in consultation with the Government of Newfoundland and Labrador, to find a solution to continue the intended winter flight series. At this time we are unable to confirm whether the winter series flights will go ahead. Once a formal determination is made, we shall advise accordingly. You will undoubtedly have many questions and we will do our best to address them over the coming days. We have formed a team of employees that will address your issues and concerns and each of you will be given a contact name with whom you can communicate directly at the resort. Also, later today, a “Question and Answer” package will be provided along with information regarding the CCAA process. During the past few days, the company as its first priority engaged in securing and protecting your assets on the resort. At the time of writing, this process continues. As we take this step, we are mindful that it creates a situation that leaves many of you with uncertainty and concern. Please know, that your interests as owners remain a primary consideration as we develop our restructuring plan and move forward. Friday afternoon at the Beach House on Humber Valley Resort, and the drinks store looks worryingly low in stock. Two bottles of red and just four of white - and no "Black Horse"! Then, on Saturday night, Humber Valley Resort's Beach House pub/restaurant Sullys closed for the last time (as we know it today). At the same time Strawberry Hill's restaurant & bar were also closed. These closures are not a huge surprise, and in a previous announcement the Beach House had been scheduled to close on the 19th Sep. However that doesn't reduce the sadness, nor impact of the closures. As everyone who has eaten at the Beach House knows, the vast majority of the staff have always been so passionate about where they work - and it's them that made the place, certainly not the food! The exception on that note was clearly Strawberry Hill, where Greg turned out excellent Fine Dining food and again everyone there made the place extra special. For those on resort for the next two weeks, extra trips to Dominion are required! Alternatively we took Tanya's advice when she told us to try my brothers place in Corner Brook up near the Comfort Inn hotel. My brothers place, turns out to be "My Brothers Place" a strangely well hidden restaurant within a very average looking Mamateek Motel. However managing to find the motel, and walking through the lobby (that felt like the waiting room for an old peoples rest home) ... we found the restaurant - and the view. That has to be the best view across Corner Brook - unless you know better? Some HVR answers - and the start of a plan! Today's press release from Newfound NV (NFLD) announced that they have filed for "protection from the creditors" for Humber Valley Resort Corporation (HVRC). This provides at least a 30 day period for the company to submit a plan for the future. Ernst & Young have been appointed to work on the plan, and there has been consultation with provisional government. It seems that this outcome is a positive move in a poor situation. All stakeholders have known for while that change is required. Now all involved in Humber Valley Resort (direct & indirect) have a breathing space, to plan for the viable future. We're hoping to meet some key individuals over the next few days, and blog accordingly. Friday, Sept 5, 2008 14:30 GMT. Humber Valley Resort (“HVRC”) has today been granted protection against creditors, in the Supreme Court of Newfoundland and Labrador, under the Companies’ Creditors Arrangement Act (“CCAA”). This follows a review of HVRC’s financial position and particularly its various contractual commitments. The conclusion of the review was that HVRC, under its current structure and with its current commitments, is not financially viable. As a result, the company filed for protection after carefully considering all options, including sending the company into receivership. After consulting with outside advisors, the company felt that all stakeholders, including chalet owners, investors/shareholders, HVRC employees, the surrounding communities and creditors would ultimately be best served by the proceedings and protections offered under CCAA. The application was filed jointly as a plan of compromise or arrangement for HVRC, so as to include Newfoundland Travel and Tourism Corporation, Humber Valley Construction Limited and Humber Valley Interiors Limited, those affiliated companies that collectively comprise the Resort. HVRC views the potential of this arrangement with its creditors, under the protections provided by CCAA, to be the most appropriate, fair and reasonable way to move forward with its plans to continue doing business. “HVRC is primarily concerned with protecting the interests of all stakeholders,” stated Derrick White, President of Newfound Canada, parent corporation of the affiliated companies, “and we believe CCAA provides us with the very best opportunity to work together with interested parties for the ongoing benefit of all. ”CCAA allows for a 30-day period during which HVRC will produce and present a plan to creditors regarding the reorganization of the Resort. HVRC sees this as a viable alternative to bankruptcy. “The company has been engaged in detailed consultation with the Government of Newfoundland and Labrador throughout its decision making process. It continues to see the resort as an asset to Newfoundland and Labrador, and consideration of those western Newfoundland communities that have served us well over the years will be at the forefront of the company’s mind,” said White. We're "planning" to be CrazyNewfoundland.com ... Are you? The whole of the Humber Valley/Corner Brook area is awash with rumours ... The 1pm HVR staff meeting is postponed - everyone waiting for news. Just a quick update ... A large number of phone calls and total confusion between the various entities involved, resulted at 10:30am today in a short term reprieve, and confirmation from a high level, the last two weeks charter flights are to go ahead. Next report - from on site! We're still CrazyAboutNewfoundland.com - Are you? Tomorrow's Humber Valley Resort (HVR) charter flight from Gatwick to Deer Lake airport is apparently to be the last for the summer season, two weeks earlier than planned. Holiday makers due to fly from the UK to Newfoundland are being rung at home to be told that if they take the flight, it is "unlikely that there will be a flight back on the 11th or the 18th". There are lots of rumours and stories flying around Corner Brook today ... hopefully most are mis-placed! Whatever ... for various reasons the summer season has been a poor one for Western Newfoundland, the businesses involved in tourism, and all the jobs that are connected directly, and indirectly to it. It's easy to under value the benefit of international tourism across the area. The tourism industry doesn't want "subsidised flights". It simply needs the "availability" of flights and routes. What value could tourism be to Western Newfoundland? With provincial marketing, more integrated infrastructure for tourism, and above all full flights, the benefits could be growing businesses, new and more secure jobs, increased provincial HST spend, and a new economy for the Island ... As the mill slowly closes down, and more and more people move (for job reasons) to Western Canada - here is one industry that has true prospects, and with a local benefit - but it needs to be supported and taken seriously at all levels ... Will it? And guess what ... CrazyAboutNewfoundland.com ... Are you? Confusion, rumours & lack of communication ... all adding to the Humber Valley Resort current problems!! This Thursday's Charter flight "might" be the last for the season - meaning that the last two flights (11th & 18th) might be cancelled. What happens to those who fly out (58+) on Thursday (4th) flight? And others that are on the resort already (currently 150+), some of whom are planning to return during the last two weeks? If you ring now to book ... they'll only sell you a single ticket, (but not return). No official answer on what is happening, nor why. Oh, and (ahead of original plan) the Activties Centre closed today! "Last Sunday Brunch" was last Sunday ... Strawberry Hill Resort (which had previously been for sale) seems to be becoming a central feature of the plan (rather than the Club house) ... and there's a rumoured key announcement later this week! PS Searching for alternative routes out of Newfoundland should we buy a "single charter ticket" ... the flights out of Halifax appear almost 100% full throughout September (due to the collapse of FlyZoom airline) ... there are very few options, actually, none worth considering! We want to be CrazyAboutNewfoundland.com - but its hard.